As a Bostik Blogger, each month I receive a box of themed craft materials to make something fun with. 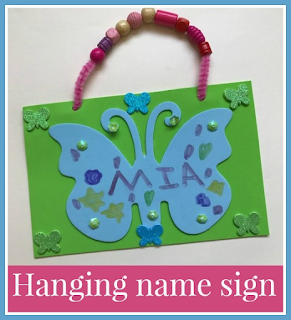 This month the theme is 'Creepy Crawlies' and I decided that I'd work with Mia to make a butterfly name sign for her bedroom. I found it easier to write the name onto the butterfly first so that Mia could see where to place the other decorations. She used a felt pen to write her name nice and clearly. Then I glued the butterfly cut out to the backing piece of green craft foam using Bostik White Glu. Mia decorated the background to the door hanger with glittery foam butterfly stickers. The sequins are stuck to the butterfly using Bostik Foam Pads. The adhesive squares are very small so they fit tidily behind the sequins and they give a nice raised effect which really makes the sequins stand out. To make the hanging loop, Mia threaded some chunky wooden beads onto the pipe cleaner, which holds them firmly in place. Then I made holes in the craft foam and threaded the pipe cleaner through, securing it firmly at the back with tape. It looks lovely hanging on her bedroom door and she's very proud of it!